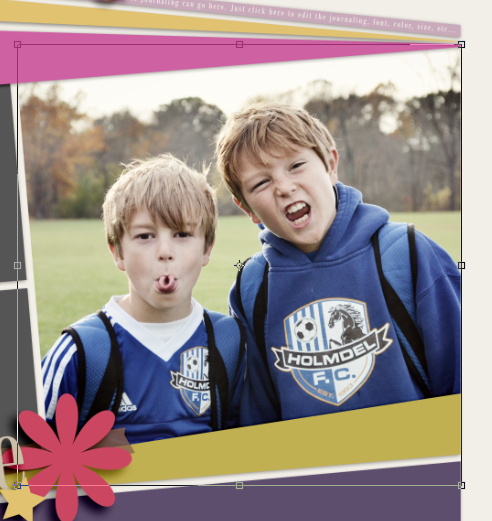 You are working on a layout and there are too many photo spots, but you don't want to delete one or just fill it in with a journal card. What about combining them to one spot!? 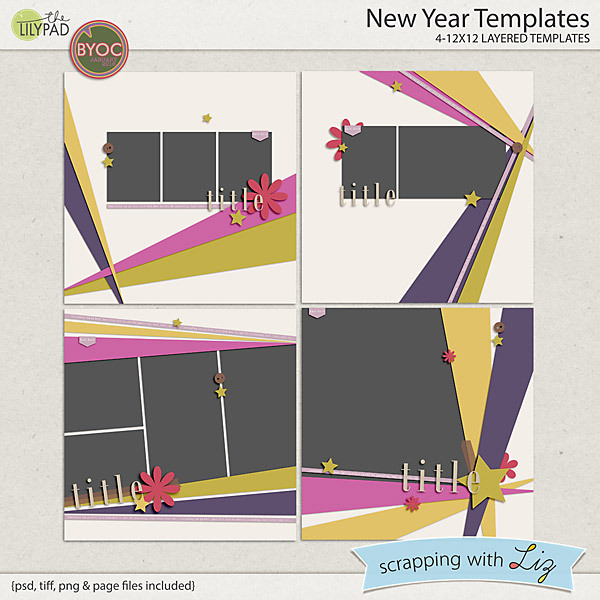 I ran into this predicament when I was creating a layout for Liz's new New Year Templates. I loved the big photos, the angles, and different shapes! BUT... I didn't have enough photos that I liked enough for the template. So, I was thinking of just putting paper, and journaling. The issue with that option was I didn't have all that much to say, lol! So, I combined two of the image spots. 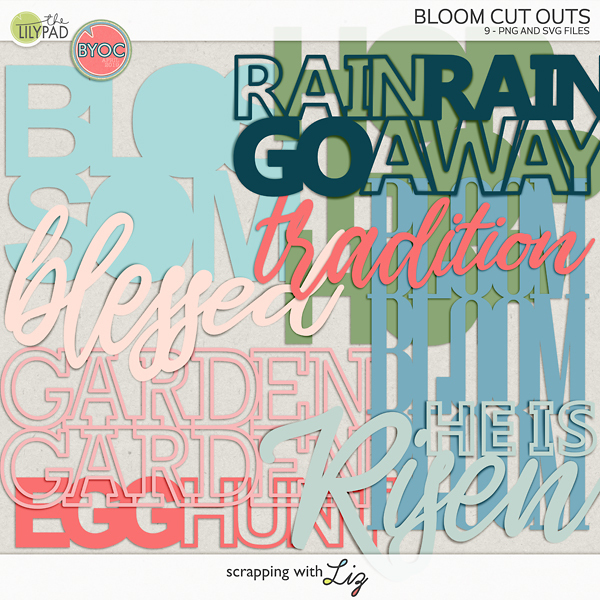 Here I will explain how I did this, using Liz's New Year Templates, and Forever Joy's Blessings Kit. This is just the version that I completed when scrapping. Quick, easy, and it worked how I intended. There are many ways to get to the same endpoint when using photoshop! My layout is also shrunken and I added two base paper layers. 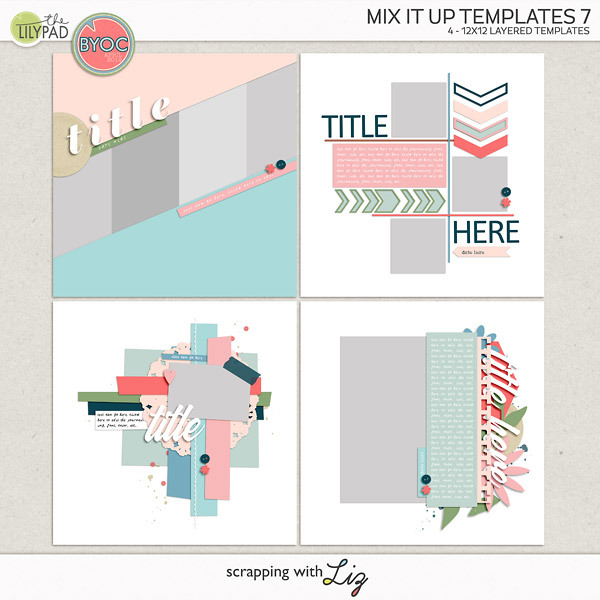 This is a fun way to take your templates and stretch them further, too! 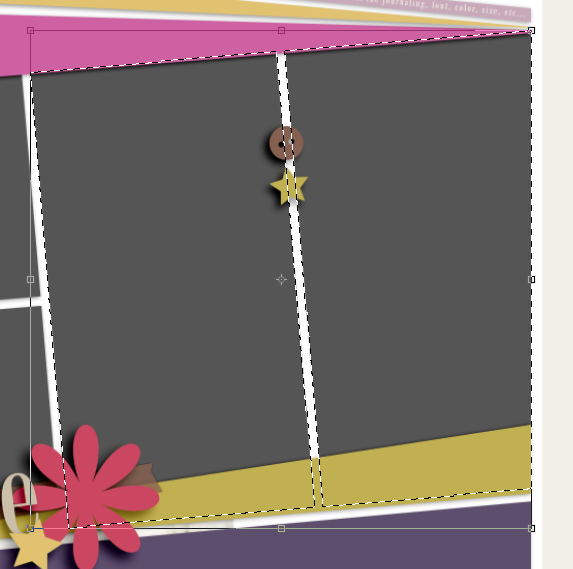 Here is the template pack, I used the one that is on the bottom, left side. As you can see, there are 4 spots, but I only needed 3 for my layout. Here are my two photo spots, and my image above them. 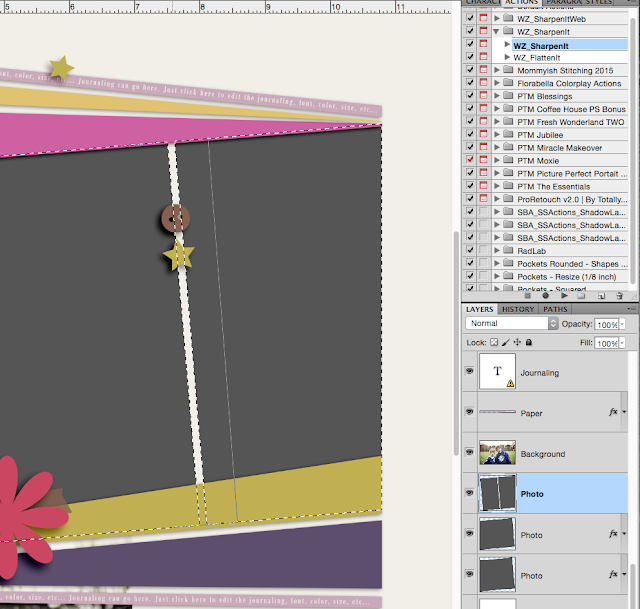 First, I right clicked on the highlighted layers and "Merged Layers." 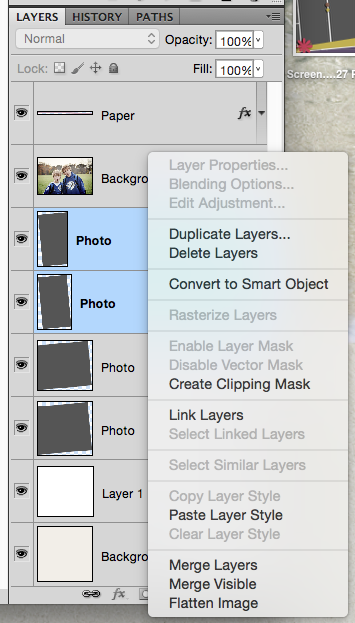 After merging, I then pressed Command + Thumbnail of the Photo in my Layers Pallette. This caused the marching ants to run around my combined photo spot! Now, Here is how I filled in that space between the photos. Next, I used the Polygonal Lasso Tool, and had the settings set to the two combining boxes. This means we will add to the selection when I've made one. If I had the cut out of the box from the other box - then that would have been a removal from the selection. Next, using the Polygonal Lasso Tool, I was able to click to make a square around the open white space. I was sure to try to meet the specific lines of the grey photo spots, since I wasn't sure what layers I would be keeping or moving. I zoomed in really close so that my lines were not jagged. This is the part that could get tricky, and come out a bit crooked or unmatched depending on how close to the marching any you can get. It was hard to get a picture of the Polygonal Lasso tool and it's corresponding mouse icon.. it disappears when I take the screenshot! Here you can see one line on the grey, and then I continued to make a box shape. Once you click the Polygonal Lasso, and connect your dots the marching ants will appear around the whole image spot. You're on our way to combining the photo spots! 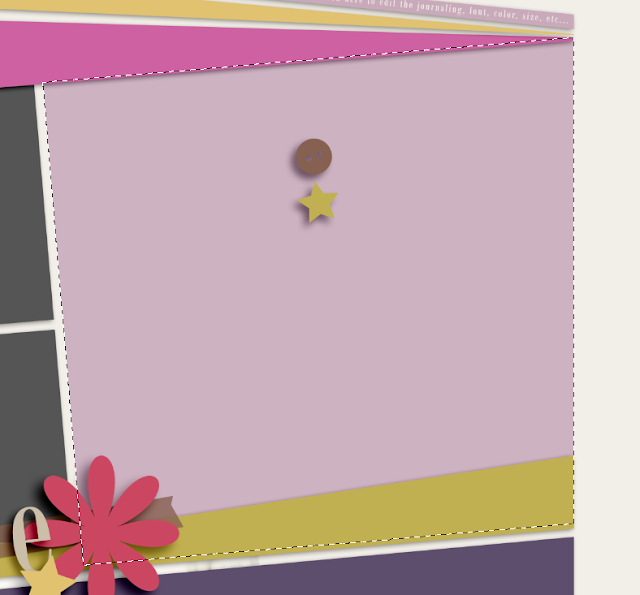 Next, you will create a layer ABOVE your photo spots by click ing on the New Layer button on the Bottom of the Layers Palette. It is the square one that has a triangle folded edge. Photoshops default is to add a layer above, but if you wanted to add one below, you just hold the Control or Command key when clicking on the New Layer Icon. I believe for Windows the correct keys are: Alt + Backspace for the Foreground and the Control + Backspace for the Background Color. Once you hit enter, you will be filling in the new layer you created above. Here is my Layer Palette. I've also turned off the visibility of the two photos below it. After that, I've clipped my photo! Ta Da. And, again, my final layout... though it's now been modified a bunch. You can still see the template and design! There you have it... combining photo spots. 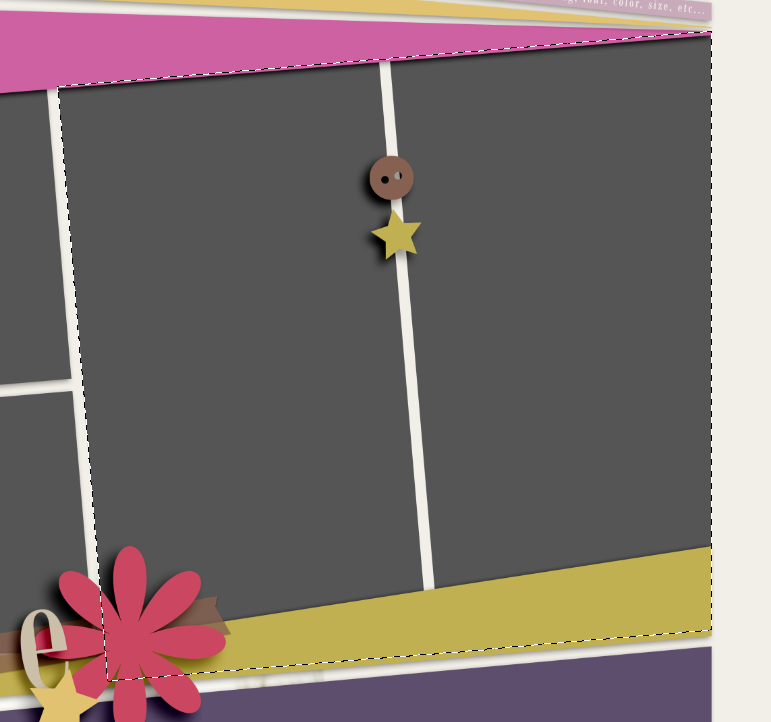 You could also feasibly combine all of the spots and have one large angled photo! That sounds cool too!